If an Immediate Termination Error (Intervention) is recorded, the LTO must also record the reason for the intervention in the space ‘OTHER DANGER/INTERVENTION’. Any person in the vehicle (e.g. LTO or driving instructor) provides verbal or physical assistance to the applicant during the test. Any person in the vehicle (e.g. LTO or driving instructor) intervenes verbally or physically during the test to prevent a collision or a potentially unsafe situation. The applicant is not penalised if the LTO repeats or clarifies an instruction. The applicant is not penalised if the LTO has to instruct the applicant to switch from high beam to low beam, provided this happens once. If a second reminder is required, an Immediate Termination Error (Intervention) should be recorded. In most cars, the dashboard high-beam warning is easy to miss in daylight. Ensuring the headlights remain on low beam in daylight is a skill that is relevant only to the Drive Test and not to normal driving, since most drivers will choose to drive with their headlights off in daylight once they have a probationary or full licence. Observed behaviour: The applicant has forgotten to release the handbrake so is unable to move off. Assessment: If the applicant realises what has happened and releases the handbrake without intervention and before a dangerous situation develops, no error is recorded. If the applicant does not realise what has happened and a dangerous situation develops, record an Immediate Termination Error (Other Dangerous Action). If the LTO or instructor has to verbally prompt the applicant to release the handbrake, an Immediate Termination Error (Intervention) should be recorded. Observed behaviour: Approaching a signalised intersection, the LTO has instructed the applicant, ‘At the traffic lights, turn right into the left lane’. During the turn, the LTO reminds the applicant, ‘Make sure you turn into the left lane’. Assessment: Repeating or clarifying an instruction to the applicant is permitted. No error should be recorded. Observed behaviour: Approaching a Stop sign, the LTO assesses that the applicant is driving too fast to stop safely at the stop line and intervenes verbally. Assessment: The LTO has intervened to prevent the development of an unsafe situation. An Immediate Termination Error (Intervention) should be recorded. The applicant disobeys a lawful direction given by the LTO on 3 occasions. The applicant disobeys a direction given by a member of the Victoria Police. If the applicant unsuccessfully attempts to obey a direction from the LTO, an Immediate Termination Error (Disobey Direction) is not recorded. Observed behaviour: The applicant is driving in the left lane of an arterial road with two lanes of traffic in each direction. The LTO initiates Task 7 (lane change right in preparation for a turn) by instructing the applicant, ‘At the next traffic lights, turn right’. The applicant checks the appropriate mirrors and activates the right-turn indicator, but lacks the confidence to complete the lane change required before the turn. As a result, she travels through the intersection without making the turn as instructed. Assessment: The applicant’s failure to comply with the instruction from the LTO was not deliberate. It was a result of lack of skill at performing lane changes, so an Immediate Termination Error (Disobey Direction) should not be recorded. However, if there was a safe gap, Gap Selection for the lane change should be recorded as No. Observed behaviour: The applicant is driving in the left lane with two lanes of traffic in each direction. The LTO instructs, ‘When safe, move to the right lane’. The applicant checks the mirrors but does not signal, do a head check or change lanes. Assessment: The absence of any signal or head check demonstrates that the applicant has not attempted to obey the instruction. This counts as 1 occasion of disobeying a direction. If 3 such incidents of wilful failure to obey a direction occur, an Immediate Termination Error (Disobey Direction) should be recorded. Observed behaviour: The applicant is driving in a local street approaching an intersection with a multi-lane arterial road. The LTO instructs, ‘At the end of the street, turn left into the right lane.’ When the applicant is stationary at the give-way line, the LTO reminds the applicant, ‘Make sure you turn into the right lane’. However, the applicant turns into the left lane instead of the right lane. Assessment: This counts as 1 occasion of disobeying a direction. If 3 such incidents occur, an Immediate Termination Error (Disobey Direction) should be recorded. While entering or leaving a parking space or performing a 3-point turn, 1 wheel mounts the kerb causing another road user to take evasive action or causing danger to property. While entering or leaving a parking space or performing a 3-point turn, 2 or more wheels mount the kerb. Any wheel mounts the kerb at any time other than while entering or leaving a parking space or performing a 3-point turn (see Figure 31). 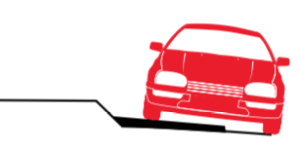 The vehicle strikes a kerb heavily, causing discomfort to occupants (Figure 29). The vehicle touches a stationary object (sign, fence, pole, tree or rubbish bin) other than a kerb. The vehicle touches any other vehicle or road user (pedestrian or cyclist). The applicant is not penalised if their vehicle collides with another road user and the collision is the fault of that road user and the applicant did not contribute. An Immediate Termination Error (Collision) is not recorded if the applicant drives over a part of the central island of a roundabout designed to be driven on by heavy vehicles. A Critical Error (Other Illegal Action) should be recorded. 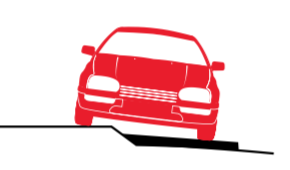 If the applicant’s vehicle contacts a kerb (e.g. while negotiating a roundabout), but does not strike the kerb heavily enough to cause discomfort to occupants, this counts as 1 error (out of a maximum of 2) for the Lateral Position Stage Assessment Item. When entering or leaving a parking space or performing a 3-point turn, if the applicant allows 1 wheel to mount the kerb, but no road user takes evasive action and there is no danger to property, a Critical Error (Mount Kerb) is recorded. 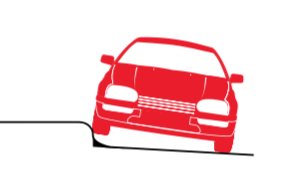 Figure 29: Immediate Termination Error (Collision) – mounting the kerb of a roundabout or striking the kerb hard enough to cause discomfort to vehicle occupants. Figure 30: Critical Error (Other Illegal Action) – driving on a part of the roundabout intended for use only by heavy vehicles. Figure 31: Immediate Termination Error (Collision) – mounting or driving over a part of the roundabout not intended to be driven on by any vehicles. When merging or diverging (including lane changes), the applicant fails to signal, resulting in another road user taking evasive action. When merging or diverging (including lane changes), the applicant both fails to check mirrors and head check, resulting in a road user taking evasive action. When diverging by at least a car width (including changing lanes), if the applicant fails to look for other traffic or fails to signal before diverging, but no evasive action is required from other road users, a Critical Error (Fail to Look or Fail to Signal) is recorded. Observed behaviour: The applicant intends to proceed straight ahead through a cross- intersection controlled by a Stop sign. He stops correctly at the Stop sign then checks for traffic from the right, but fails to check for traffic from the left before proceeding. 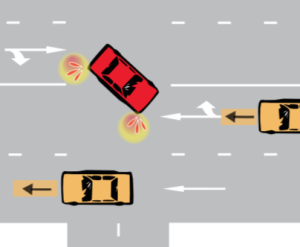 The driver of a vehicle approaching from the left must slow down to avoid a collision. Assessment: The applicant’s failure to give way resulted in another road user taking evasive action. An Immediate Termination Error (Fail to Give Way) should be recorded. Observed behaviour: The applicant faces a Give Way sign at a T-intersection and is waiting to turn left into a road with two lanes in each direction. In the left lane of the intersecting road (the lane closest to the applicant), the nearest approaching vehicle from the right is 200m away. In the right lane of the intersecting road, the nearest approaching vehicle from the right is only 20m away and is not signalling to change lanes. The applicant turns into the left-most lane without encroaching into the right. Assessment: Since the applicant does not encroach into the lane occupied by the nearest approaching vehicle (and that vehicle was not signalling to move into the lane into which the applicant turned), there is no failure to give way. No error is recorded. Observed behaviour: The applicant is turning left. A pedestrian at the intersection is about to step off the kerb to cross the road into which the applicant is turning. Seeing that the applicant is not stopping, the pedestrian stops and waits for the applicant to pass, before walking across. The applicant completes the turn without stopping. Assessment: The failure to give way has caused the pedestrian to take evasive action (stopping before crossing). Record an Immediate Termination Error (Fail to Give Way). Observed behaviour: The applicant is turning left via a slip lane. There is a pedestrian crossing across the slip lane from the footpath to the traffic island. The applicant approaches the crossing at a speed that would allow her to stop safely before the crossing. As the applicant approaches, a pedestrian is about to step onto the crossing. Seeing that the applicant is not stopping, the pedestrian stops and waits for the applicant to pass before crossing. The applicant drives through without stopping. Assessment: The applicant is required to approach the crossing at a speed at which she could, if necessary, stop safely. She is not required to give way to a pedestrian not yet on the crossing. An Immediate Termination Error (Fail to Give Way) is not recorded. Observed behaviour: The applicant is turning left via a slip lane. There is a pedestrian crossing across the slip lane from the footpath to the traffic island. As the applicant approaches, a pedestrian steps off the footpath onto the crossing. Seeing that the applicant is not stopping, the pedestrian stops one pace onto the road and waits for the applicant to pass before walking the rest of the way across the slip lane. The applicant drives through the crossing without stopping. Assessment: The applicant is required to approach the crossing at a speed at which he could, if necessary, stop safely before the crossing, and is required to give way to a pedestrian on the crossing. The applicant’s failure to give way caused the pedestrian to take evasive action (stopping to let the applicant pass). An Immediate Termination Error (Fail to Give Way) should be recorded. Observed behaviour: The applicant is approaching a cross intersection, intending to turn right. An oncoming vehicle is signalling the intention to turn left. Both vehicles are facing Give Way signs. There is no other traffic present. 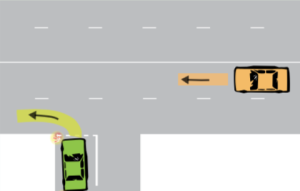 The applicant stops at the give- way line to allow the oncoming vehicle to make the left turn. However, the driver of the oncoming vehicle stops and waves the applicant to go first. The applicant turns right while the oncoming vehicle sits stationary at the give-way line. Assessment: The applicant has stopped and allowed the other driver the opportunity to go first, so an Immediate Termination Error (Fail to Give Way) should not be recorded. The decision of the oncoming driver to give way does not constitute evasive action, since it was unnecessary. No penalty should be recorded. The applicant exceeds the speed limit continuously for 5 seconds or more at any time during the test. The applicant exceeds the speed limit by 5km/h or more during the test. The applicant exceeds the speed limit by any margin for any duration in an area identified with the additional word ‘school’ (during operating hours). Driving too fast is also recorded using Task Assessment Item (Speed Choice), which is assessed for some tasks in Stage 2. The applicant stops at a position that intrudes onto or blocks a pedestrian crosswalk, causing a pedestrian to take evasive action (stop, slow, turn back, hurry or diverge around the vehicle). While waiting to turn right across oncoming traffic, the applicant stops at a position that blocks a lane for oncoming traffic (other than a right-turn-only lane) (see Figure 32). While giving way at a Stop or Give Way sign or a T-intersection or stopping at a red traffic light, the applicant unnecessarily stops at a position that intrudes into the intersecting traffic stream (see Figures 33, 34 and 35). It may be necessary to stop the vehicle on a crosswalk to view approaching traffic before completing a turn (see Figure 37). 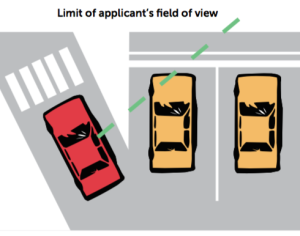 If the applicant takes all reasonable care to ensure no pedestrian has to take evasive action, and it is necessary to stop on the crosswalk to view traffic, the applicant is not penalised. If more than 1 vehicle is queuing to turn, this exception applies only to the first vehicle (see Figure 38). If the applicant stops at a position that intrudes onto or blocks a pedestrian crosswalk but no pedestrian is present, record a Critical Error (Block Pedestrian Crosswalk). Any evasive action by the pedestrian shows that the vehicle position created a dangerous situation. A pedestrian who diverges around a vehicle blocking a pedestrian crosswalk is at risk of being struck by other vehicles. 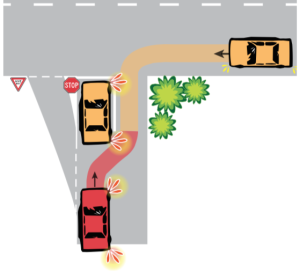 Figure 32: Stopping at a dangerous position while waiting to turn right, blocking a lane of oncoming traffic. Figure 33: Stopping at a dangerous position that intrudes into a line of traffic. Figure 34: Stopping at a dangerous position that intrudes into a cyclist’s path. Figure 35: Stopping at a dangerous position that intrudes into an intersecting traffic stream. Figure 36: After stopping, the driver is permitted to move forward to view traffic, but must not obstruct a line of traffic. Figure 37: Stopping before the crosswalk may not provide an adequate view of traffic approaching from the right. Figure 38: The red vehicle should not encroach on the pedestrian crossing until the first vehicle has departed. The applicant drives past a Stop sign without stopping. If the applicant clearly intends to stop at a Stop sign by slowing and pausing as they approach, but fails to a completely stop (wheels motionless) behind, but within 2m of, the stop line then a Critical Error (Incomplete Stop) is recorded. If the applicant fails to completely stop in the correct position at a railway level crossing when required, record an Immediate Termination Error (Fail to Stop). Observed behaviour: The applicant intends to turn right at an intersection with traffic lights (but no arrow signals for right turns). The applicant enters the intersection when the lights are green and stops to wait for a gap. There is no safe gap until the lights turn red. As soon as it is safe, the applicant completes the turn while the lights are red. Assessment: An Immediate Termination Error (Fail to Stop) should not be recorded, since the traffic lights were green when the applicant entered the intersection. If an Immediate Termination Error (Other Dangerous Action) is recorded, the LTO must record the nature of the action in the space ‘OTHER DANGER/INTERVENTION’. If the applicant creates a situation not immediately dangerous but would have been dangerous if there was more traffic, an Immediate Termination Error is not recorded. If the applicant performs an illegal action (other than those specified under the other Immediate Termination Errors) that does not result in another road user taking evasive action or danger to road users or property, the appropriate Critical Error is recorded. Any dangerous action committed by the applicant during the test indicates they cannot yet be relied upon to drive independently and safely. Observed behaviour: While driving a manual vehicle on an arterial road, the applicant attempts to change gears but cannot select the desired gear. He coasts in neutral for some distance, gradually slowing to a much lower speed than surrounding traffic, causing drivers behind to slow markedly or overtake. Assessment: The applicant’s lack of skill has caused a dangerous situation and other drivers have to take evasive action. An Immediate Termination Error (Intervention or Other Dangerous Action) should be recorded. Observed behaviour: While driving on a multi-lane road, the applicant checks the mirrors, activates the indicator and commences to change lanes without doing a head check. Another vehicle in the next lane is forced to swerve or brake to avoid a collision. Assessment: The applicant has caused immediate danger to a road user. An Immediate Termination Error (Intervention or Other Dangerous Action) is recorded. Observed behaviour: While driving on a multi-lane road, the applicant checks the mirrors, activates the indicator and does a head check. Seeing a vehicle in the lane, the applicant does not move across. The other vehicle slows to the let the applicant change lanes OR reacts with an angry gesture OR swerves away from the applicant. Assessment: The reaction of the other driver was unnecessary, as the applicant did not create immediate danger by moving across. No penalty should be recorded. Observed behaviour: The applicant is turning left from an arterial road into a local street. He stops before turning and gives way to an oncoming right-turning vehicle when there is no legal requirement. Because the applicant stops unexpectedly, the driver of the vehicle behind has to brake to avoid a collision. Assessment: The applicant’s unexpected stop has caused a dangerous situation and other drivers have to take evasive action, so an Immediate Termination Error (Other Dangerous Action) should be recorded. Observed behaviour: The applicant is turning left from an arterial road into a local street. She stops before turning and gives way to an oncoming right-turning vehicle when there is no legal requirement. There is no traffic behind and no-one is inconvenienced. Assessment: The applicant’s action did not create a dangerous situation, so no Immediate Termination Error should be recorded. Observed behaviour: While pulling out, the applicant swings too wide and the vehicle partly encroaches on the wrong side of the road before moving back to the correct side of the road. There is no traffic approaching and a clear view to the front and rear. Assessment: Unintentionally veering onto the wrong side of the road counts as 1 error (out of a maximum of 2) for the Lateral Position Stage Assessment Item. Since there is no traffic approaching and a clear view, the action did not create immediate danger, so no Immediate Termination Error should be recorded. If an approaching vehicle had been present nearby, the applicant’s action would have caused immediate danger and an Immediate Termination Error (Other Dangerous Action) would have been recorded. Observed behaviour: The applicant is driving in congested traffic and approaching a railway level crossing. The road beyond the crossing is blocked by stationary vehicles. The applicant stops on the crossing while waiting for the road ahead to clear. Assessment: The applicant cannot know whether a train will approach the crossing before the traffic ahead clears. The applicant has unnecessarily increased the collision risk. An Immediate Termination Error (Other Dangerous Action) should be recorded. 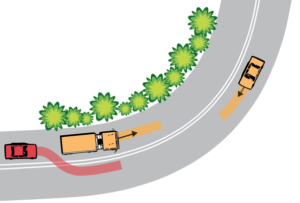 Observed behaviour: The applicant overtakes across double barrier lines while approaching a blind curve/crest. The applicant cannot see if there is an oncoming vehicle approaching. Assessment: Overtaking without a clear view of oncoming traffic unnecessarily increases collision risk. An Immediate Termination Error (Other Dangerous Action) should be recorded. Observed behaviour: The applicant is travelling along a quiet local street approaching an intersection with a busy arterial road. The applicant moves onto the wrong side of the road to diverge around a vehicle parked at the left kerb, but fails to move back to the correct side as quickly as possible. The applicant’s vehicle is still mostly on the wrong side of the road when it approaches within 20m of the arterial road intersection. Assessment: A vehicle could turn from the arterial road into the local street creating a head-on conflict. The applicant has unnecessarily increased the collision risk. An Immediate Termination Error (Other Dangerous Action) should be recorded. Observed behaviour: While driving straight, the applicant briefly veers across the centre line so that part of the car is on the wrong side of the road, then quickly returns to the correct side. There is a clear view ahead and no oncoming traffic within 200m. Assessment: No for Lateral Position (Task Assessment Item) if it occurs during an assessable straight drive; and counts as 1 error (of a permitted maximum of 2 for the stage) for Lateral Position (Stage Assessment Item). Since there was a clear view and no oncoming traffic, the error did not increase collision risk, so no Immediate Termination Error should be recorded. 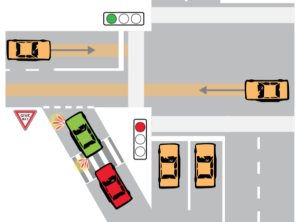 Figure 39: Driving on the wrong side of the road when approaching an intersection unnecessarily increases collision risk with a vehicle that may be approaching from the right, so an Immediate Termination Error (Other Dangerous Action) is recorded.